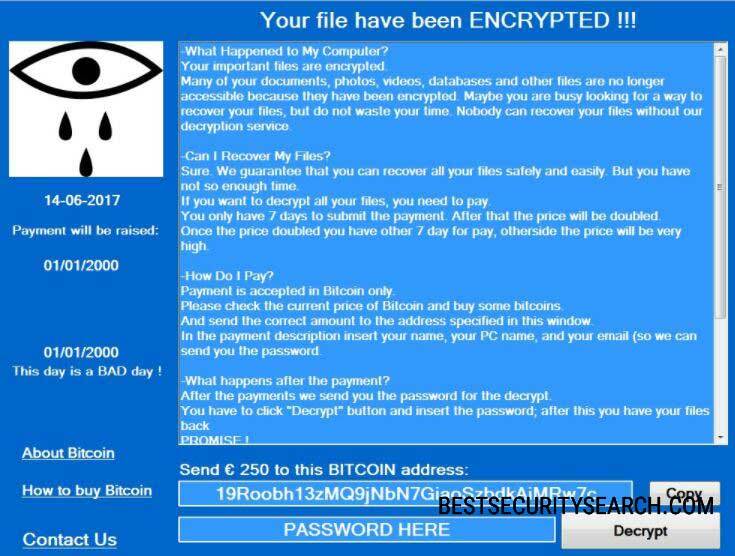 The CryForMe Virus is a new Hidden Tear based ransomware that encrypts user files and extorts the bictims for a large fee. The victims can restore their computers and files by reading our in-dpeth removal guide. How Does CryForMe Virus Infiltrate the System? The CryForMe virus is distributed using different methods depending on the chosen scale of attacks. At the moment the malware samples associated with the CryForMe ransomware are relatively low in number and this fact does not show the primary strategy used by the criminals. We suspect that email spam messages that use social engineering tricks are a primary method. The criminals craft template-based messages that make them appear as being sent by well-known companies or government institutions. Usually the CryForMe virus is attached directly to them or linked in the body contents. The payload can also be bundled with modified software installers or office documents. The infections rely on user interaction, once the targets open the files the CryForMe virus is downloaded from a remote server and executed on the local machine. Different web redirects such as malicious ad networks and scripts can also cause a CryForMe ransomware infection. Browser hijackers that modify essential settings such as the default home page, search engine and new tabs page to point to a hacker-specified site are also used as an attack vector. Direct attacks using automated software are utilized in large-scale campaigns. Security researchers discovered a new ransomware in an ongoing hacker attack. It is known as the CryForMe virus and according to the initial analysis its code appears to be heavily based on the Hidden Tear open-source project. Its appearance is not a surprise as computer criminals worldwide attempt to take upon the success of the WannaCrypt0r 2.0 Ransomware. It has been made by a hacker under the alias of Marco, not information is available about his/her identity. At the moment the CryForMe virus appears to be in an early stage of development as it only includes a simple encryption engine. Upon infection with the CryForMe virus it is started automatically following the typical behaviour patterns. The ransomware encrypts target system and user data based on a ready made list of target file type extensions. In most cases the most popular files are usually affected: documents, archives, music, photos, videos, backups and etc. Further updates to the CryForMe virus can modify the behaviour of the engine by adding a ransomware extension that can be used to mark the affected files, for example “.cryforme”. Your file have been ENCRYPTED !!! -What Happened to My Computer? -Can I Recover My Files? You only have 7 days to submit the payment. After that the price will be doubled. Once the price doubled you have other 7 day for pay, otherside the price will be very high. In the payment description insert your name, your PC name, and your email (so we can send you the password. -What happens after the payment? After the payments we send you the password for the decrypt. You have to click “Decrypt” button and insert the password; after this you have your files back. The criminals behind the CryForMe virus demand a payment of 250 Euro payable in the Bitcoin digital currency. We advice all victims not to pay the sum and use a quality anti-spyware solution that is able to delete all active infections. With a professional-grade data recovery product all affected files can be recovered. WARNING! Manual removal of CryForMe Virus requires being familiar with system files and registries. Removing important data accidentally can lead to permanent system damage. If you don’t feel comfortable with manual instructions, download a powerful anti-malware tool that will scan your system for malware and clean it safely for you. WARNING! All files and objects associated with CryForMe Virus should be removed from the infected PC before any data recovery attempts. Otherwise the virus may encrypt restored files. Furthermore, a backup of all encrypted files stored on external media is highly recommendable.